As per usual, Quico and I see the unfolding scandal that is Diosdado Cabello way differently. While Quico thinks this whole charade is only of interest to historians, I think the unraveling of the Suns Cartel has tremendous implications for the power balance within chavismo. So, first off, this is not just Leamsy any more. It’s not just Leamsy and Isea. This involves numerous law enforcement agencies and several witnesses, including drug traffickers, more informants, and more defectors. De Córdoba and Forero are two of the most widely respected journalists working in the continent. The sources of the information go beyond some gossip from Leamsy – gossip which many of you readers refused to believe a mere few weeks ago, ahem. (Now, go eat crow). The DOJ is leaking information, along with other American sources. The evidence is “extensive.” Do you think for a second they would blabbing about this to the Wall Street Journal if they weren’t certain that their case was strong? Venezuela doesn’t produce coca, the leaf used to make cocaine, nor does it manufacture the drug. But the U.S. estimates that about 131 tons of cocaine, about half of the total cocaine produced in Colombia, moved through Venezuela in 2013, the last year for which data were available. Hmm, so let’s see, in a single year 131 tons went through Venezuela. If 1.3 tons (the amount seized in the infamous Air France flight) were worth $270 million, a simple calculation says that this drug ring … is a $27 billion enterprise. Yup. $27 billion … PER YEAR. Now, not all of that belongs to the drug lords, obviously, but still, what’s their take? 15%? That comes out to roughly $4 billion. That’s still a big chunk of cash. Prosecutors aren’t targeting President Nicolás Maduro, who has been in power since Mr. Chávez’s death two years ago. U.S. law-enforcement officials say they view several other Venezuelan officials and military officers as the de facto leaders of drug-trafficking organizations that use Venezuela as a launchpad for cocaine shipments to the U.S. as well as Europe. “It is a criminal organization,” said the Justice Department official, referring to certain members of the upper echelons of the Venezuelan government and military. That’s the rub: it’s not you, Maduro, it’s him. Watch the wording from the DOJ official: “certain members” of the government. That’s obviously what US envoy Thomas Shannon is going back and forth to Caracas to discuss. The deepening crisis has made it easier for U.S. authorities to recruit informants, say those working to enlist people close to top Venezuelan officials. Colombian and Venezuelan drug traffickers have also arrived in the U.S., eager to provide information on Venezuelan officials in exchange for sentencing leniency and residency, U.S. officials say. “Since the turmoil in Venezuela, we’ve had greater success in building these cases,” said a federal prosecutor from New York’s Eastern District who works on Venezuelan cases. “We get people out of Venezuela, and we meet with them in Panama, Curaçao, Bogotá,” said a former intelligence operative who works with U.S. officials to recruit and debrief Venezuelans who have evidence of links between Venezuelan officials and the drug trade. Former Venezuelan military officers and others living outside the country provide help by contacting their former comrades and urging them to defect, the recruiter said. If the defector can provide useful information, the recruiter said, he is flown to the U.S. and a new life. This is another fascinating tidbit. It’s not that they have a single lead and it’s done – it’s that their case grows by the week. People are dying to tell their story to federal prosecutors. And when leaks reach a tipping point inside a criminal organization, what do you think that does? 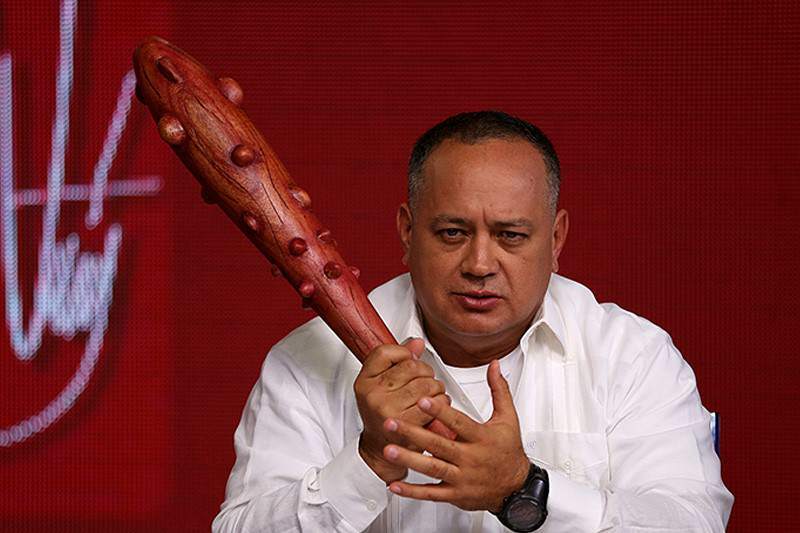 How does Diosdado sleep at night, not knowing who is going to betray him next? This is how witch hunts begin, and witch hunts are terrible for criminal organizations such as the Venezuelan government. The U.S. is also gathering information from bankers and financiers who handle the money for top Venezuelan officials. Since last year, people familiar with the matter say the U.S. government has revoked the visas of at least 56 Venezuelans, including bankers and financiers whose identities haven’t been made public. Some have sought to cooperate with investigators in order to regain access to the U.S.
As with everything the Venezuelan government does, this drug operation was anything but clandestine, and anything but competent. Everybody and their mother apparently knew what was going on, and if they knew, they kept their evidence. Furthermore, the idea that people are flipping – particularly bankers – spells a pernicious scent of doom on the Venezuelan government’s ability to raise cash in international markets. Because, how often does Wall Street lend money to drug cartels? And what does it say when 56 Venezuelans (not just the seven, but eight times that) have had their visas revoked in secret? Also, which bankers have had their visas revoked? The Americans are playing hardball with the weak Maduro, and we don’t know the half of it. In fact, we only know the 7/56th of it. Finally, there is the geopolitical angle, which the article wisely skips over. It’s one thing when a crazy half-wit controls the world’s largest oil reserves, it’s quite another when organized crime does it. The confirmation that Venezuela is a narco-state would have a tremendous impact on regional support for Maduro. Don’t doubt for a minute that this classified Dossier will make its way to Planalto, Moncloa, Nariño, or la Casa Rosada. To what extent will regional leaders be willing to stick their necks out for Maduro in the face of all the evidence the authorities claim to have? This case threatens the internal cohesion of chavismo. It threatens the functioning of the internal bureaucracy of the government and of the military, and it threatens the international coalition – propaganda, financial – that keeps the Maduro machine working. Of course, it may well be that none of this makes an iota of difference and that Quico is right. But this time – truthiness alert – it feels different. American law enforcement has taken this game to a whole new level. It would be surprising – neh, shocking – if this whole thing just died down.